HTTPS security isn’t just for banking websites or passwords any more. The entire web is quickly changing to be served over a secure connection, and if your website doesn’t have the ubiquitous secure lock icon, there can be some serious consequences. Recently, Google started boosting HTTPS websites over standard HTTP URLs in search result rankings. Web browsers are also starting to warn users when a website isn’t secure, which can make visitors uneasy and damage their trust in you. And the speed and performance improvements in the new HTTP/2 protocol are only experienced when the page is served over HTTPS. Protecting your users should be the #1 priority, and an insecure website can put them and their data at risk. Hackers can easily gain access to unencrypted transmissions, but with SSL/TLS encryption, everything is safe and secure. 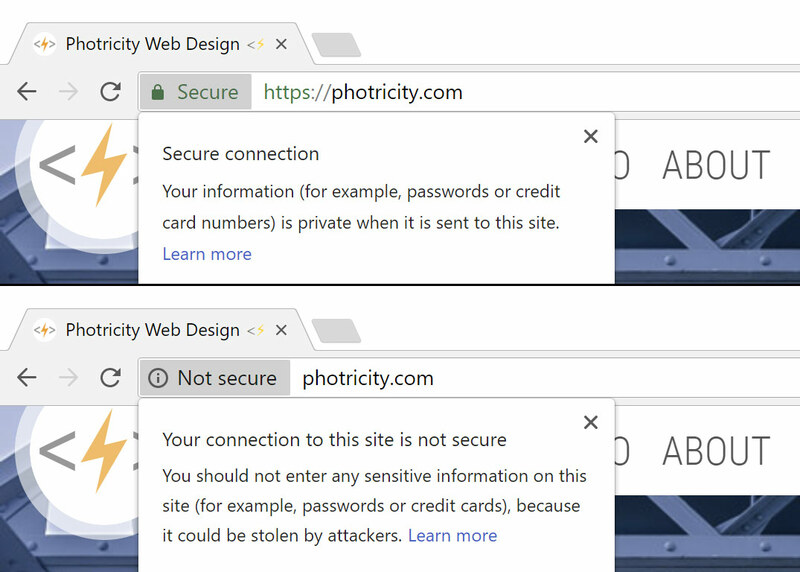 When you host your site with Photricity Web Design, we provide HTTPS security by default for free. Help your website reach maximum voltage with HTTPS and other best practices for the web.